Wage gaps between women and men in Israel have narrowed over the years, but are still large. A new Taub Center study reveals that the most substantial factor behind the disparity is the fact that, on average, women work fewer hours than men, but another key factor is that women are more likely to be employed in lower-wage occupations and industries. The wage gap between women and men in Israel’s labor market ranges from 32% to 42% (depending on the calculation method used). This difference has been studied extensively, and opinions differ as to its source; some attribute it to discrimination against women, while others maintain that the gap is rooted in essential differences between the genders and in their differing occupational preferences. A study by Taub Center Researcher Hadas Fuchs that was recently published in the Taub Center’s State of the Nation Report 2016, sought to assess the status of women in the labor market, focusing on the causes of the male-female wage gap. 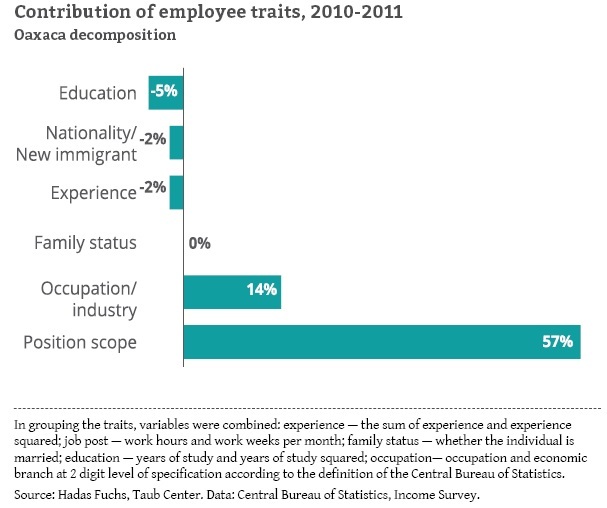 Fuchs assessed the gap in light of employees’ personal and demographic characteristics, including number of working hours, education level, and the occupations and industries in which the employees worked. The assessment included data from 2010-2011. Fuchs’ calculations indicate that the most important factor behind the gender wage gap is the number of work hours, with 57% of the gap being due to women’s smaller position scope (i.e., less than full-time employment) (see Figure 1). In 2015, 34% of working women aged 25-54 were employed part-time, versus 17% of men; even among those with full-time jobs, women worked fewer hours. The second most important cause, which is responsible for 14% of the wage gap, is the difference between the occupations and industries in which men and women work. Men work in occupations where the average wage tends to be higher (as shall be seen below). By contrast, the number of years of schooling variable reduces the gap by 5%, as on average, women are better-educated than men – and a higher education level raises the average wage. Overall, more than two-thirds of the wage gaps arise from the variables that Fuchs assessed, among them one’s years of experience, position scope, family status, and education. The portion of the gap that is not explained by these variables could reflect discrimination, but it might also be due to attributes that could not be measured in this study, such as personal abilities, the exact job held by a given employee, or more precise detail regarding occupation. So that the “personal ability” component (which is presumably a major determinant of wage) could be taken into account, Fuchs used a special Central Bureau of Statistics database, which, in addition to the data shown above, also included matriculation and psychometric exam scores. These exams reflect, to a certain degree, the requirements of the labor market, and scores on these exams can thus serve as a good indicator of an employee’s “quality” in terms of remuneration for their work. This database contains information for those who were ages 29-31 in 2008. One of the most interesting findings obtained through this estimation is that the occupation/industry component has a greater impact on wage gaps [in the 29-31 age group] than in all age groups taken together – a fact that underscores the importance of occupational choice in determining women’s future wages. Among those with academic degrees, this component had the greatest impact on the wage gap, explaining over half of the disparity (as seen in Figure 2). Differences in matriculation and psychometric exam scores increase the wage gap; their joint contribution to the explained gap was 13%. Fuchs explains this by noting that, although women have a higher matriculation average than do men, five units of mathematics study and the quantitative portion of the psychometric exam have relatively great influence on wage, and women tend to have lower achievements in these spheres. In this calculation, the unexplained wage gap was only 6%. In light of the major role of mathematics attainment in determining wage, the study examined the gender gaps in this sphere at various stages along the lifecycle. The data indicate that women’s lower achievements in math are discernible from a young age; among Jewish Israelis, girls’ achievements on the Grade 5 GEMS exams in mathematics are lower than those of boys (though girls outperform boys in English), while on the PISA tests their achievements are lower in math and higher in reading. In secondary school fewer girls study math at the 5-unit matriculation level, and their average score is lower. At the academic level, in all degree programs, women account for at least half (and often more than half) of students, but they tend to study therapy and education-related fields. In contrast, men comprise the majority in the mathematical and scientific disciplines, which are associated with higher average salaries. In 2014, for example, only 27% of students in mathematics, statistics and computer science were women. 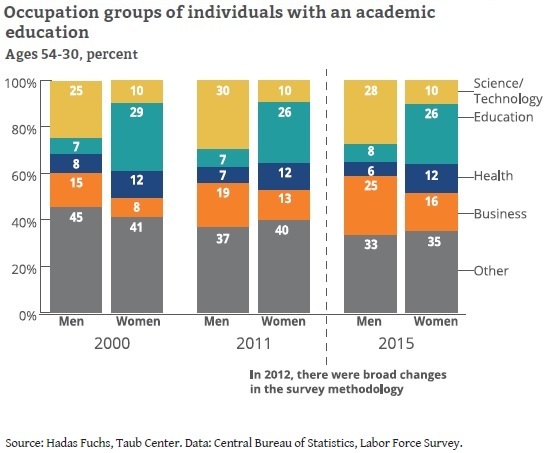 Gender polarization continues into the labor market, where a high percentage of women are still employed in education and a very low percentage in high-tech occupations. Even among computer science graduates, a relatively high percentage of women do not go on to work in this field. The reason for this may be that women enter occupations, such as education, that provide them with flexible working hours and part-time employment options, and avoid occupations that are regarded as demanding in terms of the number of work hours, such as technology, science and finance (as shown by Figure 3). Given these findings, it appears that in order to reduce wage gaps, it is important to raise awareness of the impact that choice of academic field has on wage. Additionally, the contribution of mathematical ability to wage, and women’s lower attainments in math-related fields from an early age, highlight the need to persevere with programs that encourage women to study scientific subjects at a high level. The question of why women do not enter STEM (science, technology, engineering, mathematics) fields, which are considered prestigious and known to offer high salaries, should also be examined in greater depth. Fuchs notes that the reason for this may be that women are still thought to be their children’s primary caregivers, and to bear most of the responsibility for housework. If this is indeed the reason, then one should consider the possibility of offering work-schedule flexibility and shorter work days to both men and women, which would enable suitable women who so desire to enter these fields, fulfill their potential and reduce overall gender wage inequality.